Softcover. Bethel CT, Apple Comics, 1st, 1994, Book: Very Good, Dust Jacket: None, Softcover, stapled comic book with color wraps, 28 pages illustrated in b&w by Lomax. 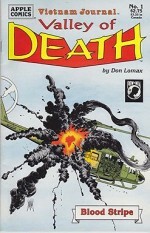 Creator Don Lomax, a Vietnam War veteran, has entrenched his Vietnam Journal as one of the most realistic graphic representations of the Vietnam War. Recommended by The Military Book Club. Clean, bright copy.